(RRP £219.99). 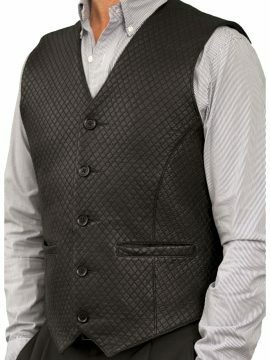 A leather waistcoat with a difference – this is a classy item that oozes quality, combining a luxuriously soft smooth lambskin nappa leather at the back with the elegance of a fine weave tweed fabric at the front, making it ideal for smart wear, and versatile so you can wear under a smart jacket, showing only the tweed fabric (plus leather pocket trim), or on its own over a shirt, showing also the leather back, with adjustable buckle-belt. It is exquisitely tailored and is styled to give a slim (‘vest-like’) fit when fastened, although you may prefer to wear it open if wanting a slightly more casual look. The waistcoat has a 4-button front fastening, 2 front pockets with leather flap and matching button and a breast pocket with leather trim. It is fully lined. Made by Ashwood exclusively for Tout Ensemble. Available also in larger sizes, up to chest 56in/142cm. Please see our Product Description below for full details and important sizing information. (RRP £219.99). A classy, high quality leather waistcoat that oozes quality, combining a luxuriously soft smooth lambskin nappa leather at the back with the elegance of a fine weave tweed fabric at the front. 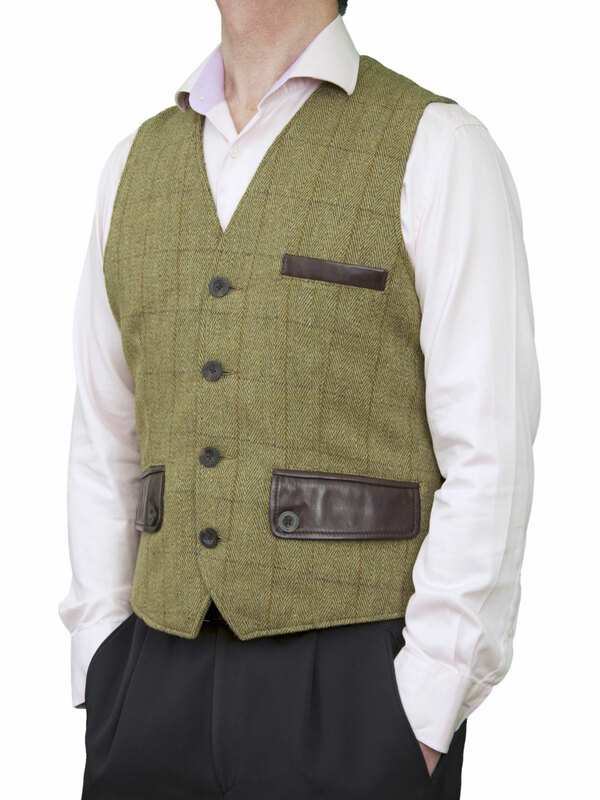 Exquisitely tailored, this tweed and leather waistcoat is styled to give a slim (‘vest-like’) fit when fastened, although you may prefer to wear it open if wanting a slightly more casual look. 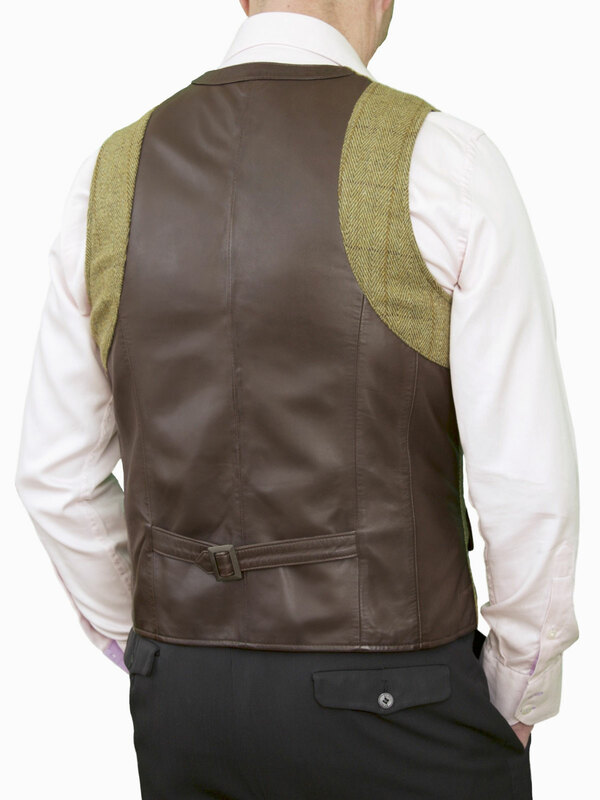 The waistcoat has an adjustable back-buckle belt, a 4-button front fastening, 2 front pockets with leather flap and matching button and a breast pocket with leather trim. It is fully lined. Made exclusively for Tout Ensemble by Ashwood. This waistcoat is styled to give a slim snug fit when fastened. Our best advice? Do not choose the size you think you are normally – please get the tape measure out and measure your chest & waist! PLEASE TAKE THIS INTO ACCOUNT WHEN CHOOSING YOUR SIZE. Our Sizing Information gives more details. Please feel free to contact us for any further help or advice. We are only a phone-call or e-mail away. (RRP £209.99). 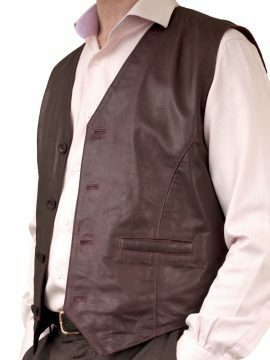 This is another superbly tailored fine quality mens leather waistcoat made exclusively for Tout Ensemble by Ashwood. Each waistcoat is made in high quality, luxury soft smooth lambskin nappa which has a special waxed finish to give a subtle shading effect for added style. Even the buttons have a matching shaded look. 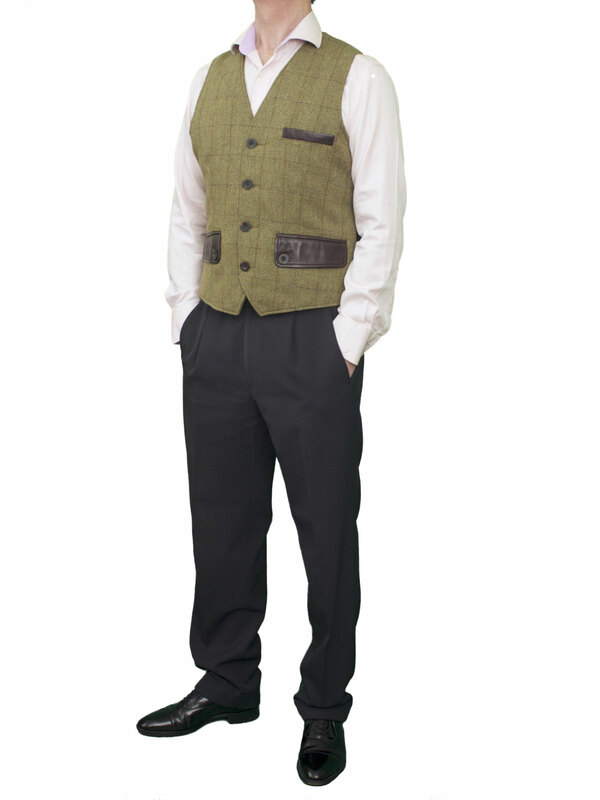 The waistcoat is a classic design with 2 front pockets and plain back, with stitching detail on the seams and styled to be slim-fitting when fastened. Please see our Product Description below for full details and important sizing information. (RRP £119.99). 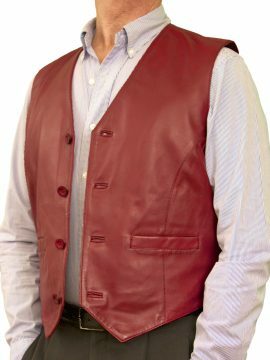 This mens leather waistcoat in deep burgundy is made from fine quality soft lambskin nappa that is a little more lightweight than our other waistcoats, specially for those wanting a waistcoat for less formal, everyday wear e.g. with jeans or casual trousers. It is a superbly-tailored waistcoat at a great price. As with all other waistcoats, it is styled for a snug slim fit when fastened - and it looks great worn open. Fully lined. Please see our Product Description below for full details and important sizing information. (RRP £349.99). 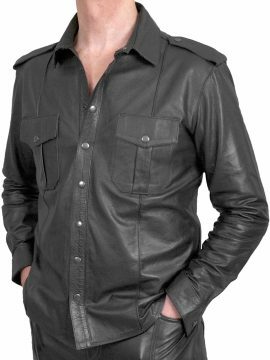 An exceptional mens leather shirt for smart-casual wear, made in a soft high grade cowhide leather that has added durability. It is a classic style with an 8-press stud front fastening and matching press studs on breast pockets, cuffs and shoulder epaulettes. NOTE: It is a slim-fitting shirt so if your waist is larger than your chest, then you may not be able to fasten it comfortably, but you can wear it open over your T-shirt so it is more like a jacket. Looks great with our mens smart lambskin leather trousers (shown in our images here.) Please see our Product Description below for full details and important sizing information. (RRP £299.99). 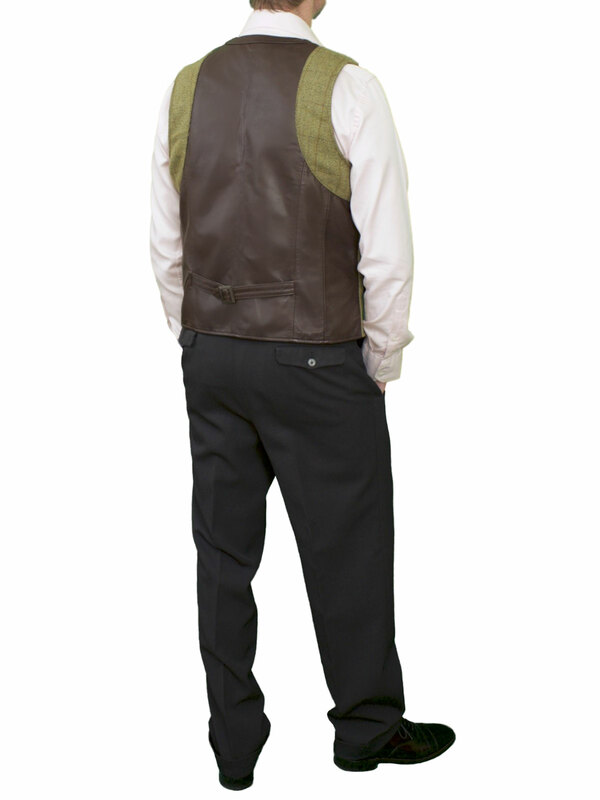 This is a very special mens leather waistcoat that features diamond-shaped stitching detail - very smart! It is exquisitely tailored in fine quality soft lambskin nappa leather and also has an adjustable back buckle-belt, 5-button front fastening. There are 2 front slit pockets and an inside breast pocket. It is fully lined in matching colour fabric. NOTE: It has been styled to give a snug/slim fit when fastened. Exclusive to Tout Ensemble by Ashwood. Available in black, burgundy, toffee and biscuit. Please see our Product Description below for full details and important sizing information.